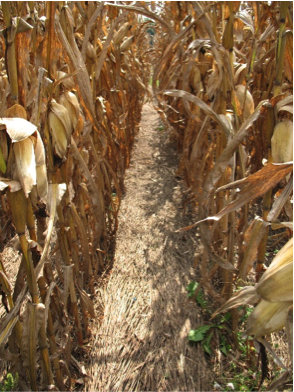 Organic no-till corn production is increasing in popularity among producers due to known environmental benefits and also because it can reduce dependency on cultivation as the primary weed control mechanism. High reside cover crop stands can be killed with a roller-crimper (roll-killed), creating a weed suppressing mulch. This production practice has been particularly successful in North Carolina for organic soybean production when rye is used as a high biomass cover crop and is roll-killed prior to planting. To achieve maximum corn yields, additional fertility, beyond that provided by the cover crop, will be needed. We conducted studies to evaluate different starter fertilizer sources and their impacts on yield and weed competition in organic no-till corn production, using a cover crop mulch for weed suppression. Research was conducted at Kinston and Salisbury in the 2013 and 2014 corn growing seasons. A cover crop mixture of Purple Bounty hairy vetch (12 lbs/acre) and Wrens Abruzzi cereal rye (90 lbs/acre) was planted from mid-September to mid-October, depending on study site. Cover crops were drilled into a clean-tilled seedbed, and were roll-killed one week prior to corn planting at three of the four study sites. Rolling occurred again at planting. At the fourth study site, roll-kill occurred at planting and then again one week later. Photo 1 illustrates cover crop termination of the rye/vetch mixture utilizing the roller-crimper. Dr. Chris Reberg-Horton, Crop Science Professor at NC State University, has been continuously modifying a no-till planter in order to create a planter which will reliably and efficiently plant into high cover crop biomass stands. Current planter modifications include both Yetter row cleaners and residue slicers mounted to an added front toolbar. We targeted populations of 28,400 in Kinston and 31,800 in Salisbury. While perfect stands were not achieved in these studies, stands were good, with minimal gapping. Some issues still need to be addressed with the current planter setup, but stands achieved in this study were impressive compared to research done in this system to date. Table 1. Average cover crop biomass across study sites. Table 2. Starter fertility treatments. 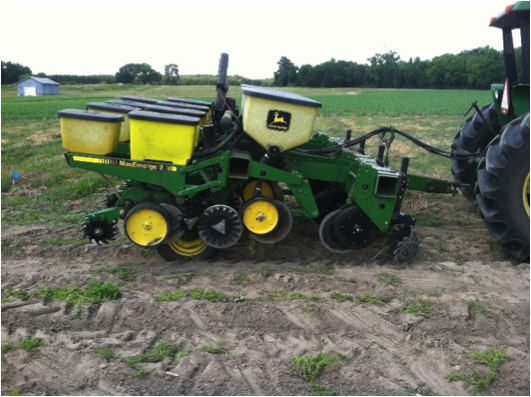 * For subsurface treatments, starter fertilizer boxes on the John Deere 7200 planter were used to deliver a subsurface banded fertility application. Pelleted material was used for each treatment, with fertilizer hoppers set to wide open, delivering between 575-625 lbs fertilizer/acre. ** Feather meal source was NatureSafe Blending Base (13-0-0). *** Subsurface banded poultry litter application was done using pelleted poultry litter. Loose litter has been known to clog fertilizer hoppers. Despite using the pelleted litter, tractor speed was still required to be very slow to prevent clogging. **** The same cover crop mixture was planted across all fertility treatments. Cover crop termination of the rye/vetch mixture utilizing the roller-crimper. Current planter set-up with residue slicers and Yetter row cleaners mounted on the front toolbar. Cover crop mulch suppressing weeds at corn blacklayer in the Salisbury 2013 study site. Overall, very good weed suppression was observed at three of the four study sites (Kinston 2014, Salisbury 2013, Salisbury 2014). There was less than 10% weed coverage across all treatments. 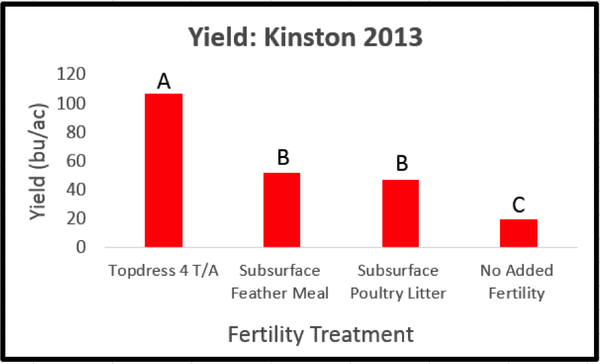 The Kinston 2013 site had lower cover crop biomass (Table 2) and much higher weed pressure; therefore, fertility source had more of an impact on weed pressure and yield. The topdress fertilizer treatment had the highest yield and lowest weed pressure at this location because there was sufficient nitrogen for the corn crop to be competitive with weeds early in the season. Yield results are presented from three of the trial sites. Field plots at Kinston 2014, Salisbury 2013, and Salisbury 2014 all had excellent weed suppression from the cover crop mulch, with cover crop biomass reaching over 8,000 lbs/acre at all three environments. 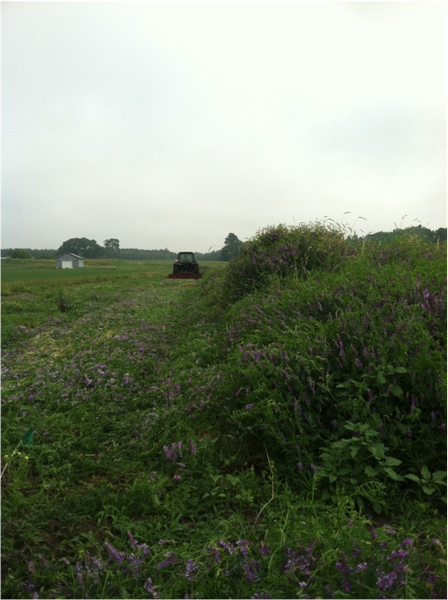 Our Kinston 2013 site had the lowest cover crop biomass, with only 5,700 lbs/acre biomass. The yield data from this site shows the importance of providing plenty of nitrogen early in the season to give the corn crop a competitive advantage against weeds. In our subsurface and no added fertility treatments in Kinston 2013, there was high weed pressure and this had a large impact on yields. The rye/vetch cover crop mixture provided excellent weed suppression at three of the four study sites. Cover crop biomass over 8,000 lbs/acre is necessary to ensure good weed suppression by the cover crop mulch. Rolling the cover crop one week prior to corn planting, and then again at corn planting seemed to be the most effective method for ensuring cover crop termination and effective corn planting. 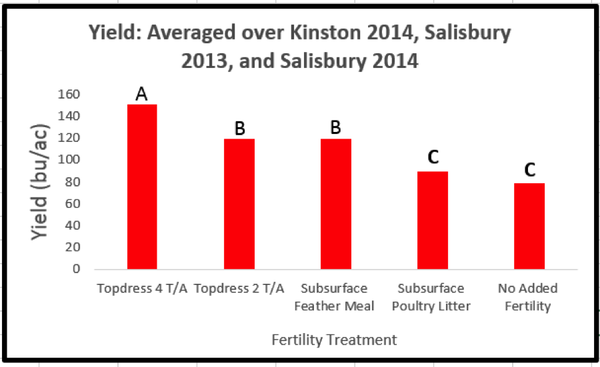 The topdress fertility treatment achieved the highest yields across environments, and had the lowest weed pressure among treatments in the Kinston 2013 site where weed pressure was high. Unless producers are restricted by how much P can be applied, the feather meal treatment does not seem to provide enough benefit to outweigh its high cost. Additional study years and sites are needed in North Carolina to investigate this system further before recommendations are available to organic producers in the state. This material is based upon work supported by the Natural Resources Conservation Service, US Department of Agriculture, under Grant Agreement Number 69-3A75-11-193.